When placing an order with my suppliers, I like to browse through the available items rather than doing a ‘quick order’ by just entering the item numbers I need. This can sometimes be very dangerous or lead me to new and wonderful things. As I was placing my C-Lon order, I came across the new neon colors. Well of course I had to get some. I have visions for using them in kumihimo, embroidery, crochet, macrame, etc., etc. (I’m thinking about a project or two I might do). Don’t you just love the colors? Clockwise, from top left, Neon Yellow, Neon Orange, Neon Green and Neon Pink. 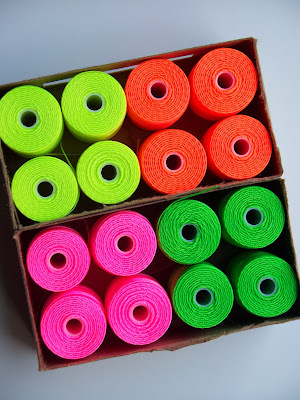 As the other colors, they are just $3.75 for an 83 yard spool. All the colors I have in stock (over 65) can be found on my website – http://www.patpowelldesigns.com. … and I bet you didn’t have to pump up the color on your photo at all … Those are bright! The colors in the pic may be a bit darker than they really are!! !